Earlier in India, oral hygiene was the domain of local home made ayurvedic powders and natural herbs. The history of toothpaste industry in India can be traced back to the year 1975. Now, the awareness regarding oral hygiene in the Indian society has increased and thus many companies have come up with their brands of toothpaste. 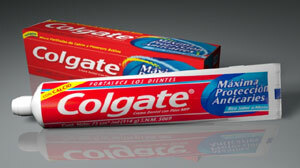 The first toothpaste to enter the Indian market was Colgate. In recent years the Industry has shown impressive growth rate of 18.6%. Both the Gel and Cream segment of toothpaste industry are growing at a fast pace. The growth is particularly prominent in the urban areas. In Urban India, the usage of toothpaste per person per year is more than 190gms. Here is a list of the most popular toothpaste brands in India. 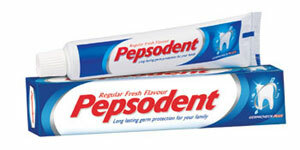 Pepsodent is the most popular brand of toothpaste in India. Its minty flavour derived from Sassafras gives a fresh breathe and a cool toothbrushing experience. Pepsodent was launched in 1993 in India and since then the brand has raised the benchmark on Oral Care solutions in India. The brand is owned by Unilever. Pepsodent has a range of toothpastes and toothbrushes that could take care of specific oral care needs. Pepsodent toothpaste fights germs to protect teeth against cavities and gives strong teeth, fresh breath and healthy gums. Pepsodent as an oral care expert offers solution to specific problems like bleeding gums and sensitive teeth. Colgate India is the leading toothpaste manufacturer in India offering a full range of oral hygiene products and colgate toothpaste brand that include Colgate Dental Cream, Colgate Total, Colgate Sensitive, Colgate Sensitive Pro-Relief, Colgate Max Fresh, Colgate Herbal, Colgate Fresh Energy Gel, Colgate Kids, Colgate Active Salt, Colgate Whitening. this entire range of toothpastes protects teeth against harmful bacteria and gives strong teeth with fresh breathe and healthy gums. 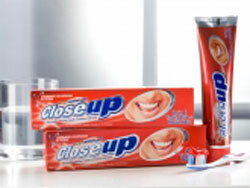 Close Up is the original youth oral care brand of Unilever Arabia and Middle East. It is one of the first brands targeting youth in the oral care market globally, with an edgy and youthful image which stays relevant till date. A unique brand identity was developed, with Close-Up positioned as the toothpaste that gives people confidence in those very “up close and personal” situations. Close Up is the First toothpaste in US to combine mouthwash and toothpaste in one formula and also, it is the First gel toothpaste in the world. Close-up is still symbolized by attractive white smiles in very close situations. Sensodyne is a toothpaste, toothbrush and mouthwash marketed for individuals with sensitive teeth and/or dentine hypersensitivity. It is a registered trademark of GlaxoSmithKline. Used everyday, Sensodyne relieves sensitive teeth by blocking the pain caused by hot, cold, sweet, acidic and other contact triggers and helps to keep it from coming back. 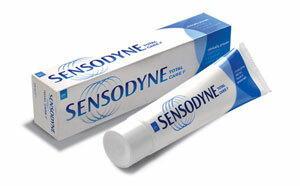 Sensodyne is the number 1 desensitizing toothpaste, has been relieving the pain of sensitive teeth for over 40 years. It’s the treatment your sensitive teeth deserve. It Contains an active ingredient, Potassium Nitrate, that is clinically proven to reduce painful sensitivity. Aquafresh is a brand of toothpaste that has been on sale since 1973.It is manufactured by consumer healthcare product maker GlaxoSmithKline. One of its distinguishing features is its striped pattern; currently the stripes are red, white, and blue, although initially there were only blue and white stripes. 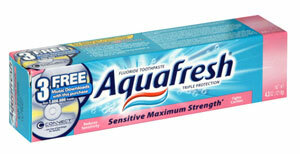 The slogan for Aquafresh is “three in one protection for your family”. The variants available are Aquafresh Triple Protection, Aquafresh White & Shine, Aquafresh Extreme Clean, Aquafresh Bubblemint, Aquafresh Isoactive, Aquafresh Training Toothpaste. 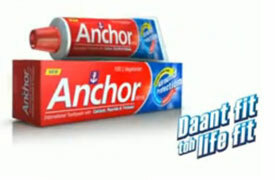 Anchor toothpaste is a leading brand of toothpaste in India. It helps fight against germs and keeps teeth healthy and shiney white with strong gums and fresh breathe. Anchor Health and Beauty Care was founded in 1997, and today it is one of the fastest growing companies in its domain. Anchor is a respected and established oral care brand in India. Anchor toothpastes contain ingredients necessary for everyday protection against germs and bacteria. Apart from toothpastes, Anchor toothbrushes and toothpowder are also available. Dabur Red Tooth Paste is a fine blend of herbs that eliminates many dental problems like gum disorders, toothache etc., thereby giving strong teeth and healthy gums. Natural ingredients like Clove and Mint gives a refreshing breath. Dabur Red Toothpaste is packed with the power of 13 active Ayurvedic ingredients like Laung Pudina & Tomar, that keep all your dental problems away. It is the first-ever toothpaste which keeps all your dental problems away, thereby providing you strong teeth. Its superior formulation that has been scientifically validated has made Dabur Red Toothpaste the prefered oral care brand for millions of Indians. 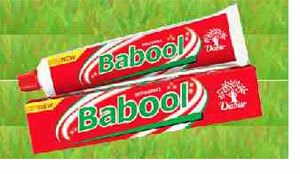 Babool Toothpaste is a natural toothpaste packed with the medicinal benefits of Babul tree ‘Acacia Arabia’. The Babul herbal extract in Dabur’s Babool Toothpaste helps prevent swelling and bleeding of gums, keeping your gums healthy and teeth strong. Dabur’s Babool Toothpaste now comes in a neem variant, offering the additional medicinal benefits of Neem for complete oral care. Dabur Babool Toothpaste is a natural toothpaste helps prevent swelling and bleeding of gums, keeping your gums healthy and teeth strong. Meswak is a scientifically formulated herbal toothpaste with pure extract of the Miswak plant ‘Salvadore Persica’, the famous ‘Toothbrush Tree’ used for centuries. The astringent and anti-bacterial properties of Meswak help reduce tooth decay, fight plaque and prevent gum diseases. 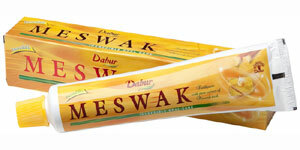 Miswak Herb is a rare, potent, priceless, wonder herb that delivers incredible Oral Care benefits. 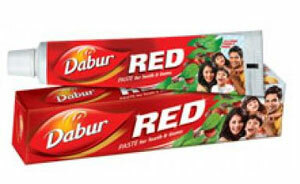 Dabur brings this wonder herb in the form of Incredible ‘Meswak’ toothpaste. It is scientifically proven to reduce tarter & plaque, fights germs & bacteria to keep gum healthy, helps prevent tooth decay, eliminates bad breath and ensure strong teeth. Vicco Vajradanti Ayurvedic Toothpaste is the original Ayurvedic toothpaste from India. Vicco cares for your mouth – effective, active, totally natural. 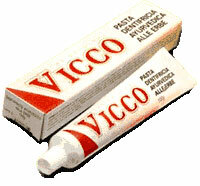 Vicco cleans your teeth, refreshes your breath, and stimulates your gums. Every tube of Vicco contains 20 pure herbal extracts, long established by Ayurvedic herbal tradition to be good for teeth, mouth and gums. Ayurvedic practice, centuries old, actively involves those elements in nature that are most beneficial for your body. Vicco uses only the purest herbs and ingredients. Other popular toothpaste brands in India are Promise, Amar, Ajanta, Neem Active, Herb Dent, Herbodent, Sundent, Himalaya Dental Care, Amway Dental Care.